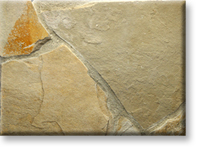 Description This Lompoc Oatmeal Cream flagstone is special sorted to the very light and creamy color of our regular oatmeal with only 25% or less gray in the blend. The pieces range in size from approximately 8"x8" up to 14"x14" in diameter and the thickness ranges from 1-1/2" to 2-1/2". The cream color is also available in our #1 Premier Cut and our guillotined Ledge. Application & Use Residential or commercial applications for paving: walkways, patios, entries, floors, decks, driveways, veneer for interior or exterior walls, columns, fireplace faces, chimneys, barbecues, planter veneers, waterfalls, water features, ponds, swimming or natural pools; seats, stair treads, lampposts, column cap, etc. Size 8"X8" up to 14"x14"
Average Bed Depth 1-1/2"-2 1/2"